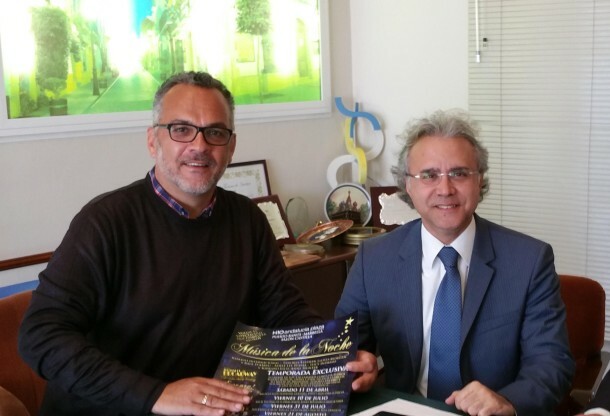 Music of the Night – Música de la Noche – 2015 – Marbella Ayuntamiento supports – ´Music of the Night´ shows. | Marbella Marbella – Adelante! Marbella Ayuntamiento supports the ´Music of the Night´ shows. Last Friday, Event Promoter Nick Holland-Morgan was invited by Marbella Tourist Minister, José Luis Hernández, to present details of the exclusive season of 5 very different ´Music of the Night´ shows to be staged at the H10 Andalucía Plaza Hotel, Puerto Banus, this spring and summer. The Tourist Minister said “We are delighted that these shows, which are unique to the Costa del Sol, are being performed here in Marbella”. He also commended the fact that they were being produced, not just with the British expatriate audience in mind, but also for the Spanish, as well as the many other nationalities, including Russian, German and Swedish, that comprise the population and visitors to the very cosmopolitan town. Nick says “We would like to thank the Tourist Minister and the Ayuntamiento for their very enthusiastic on-going support of everything we do in the town and we look forward to welcoming Mr Hernández and the Mayoress, Ángeles Muñoz, when they join the audience for the first show next month!” ´Music of the Night´, produced by and starring Welsh Tenor Stephen Lloyd-Morgan, brings together the best of his 3 other popular sell-out musical theatre, opera and classical shows, ´West End Musicals in Concert´, ´Encore! Tenors´, and ´The Best of Broadway´. The first show of the season is on 11th April and tickets can be purchased online at www.motn2015.com or at the reception of the H10 Andalucía Plaza Hotel. Information, call 665 892 988. We are delighted to announce the return of the hit sell-out show ´Music of the Night´ to the H10 Andalucía Plaza Hotel, Puerto Banus, Marbella, for an exclusive season of 5 different performances this spring and summer! TICKETS ON SALE NOW. Please find information on our new website www.motn2015.com, where you can also select your seats and purchase tickets. You can also book direct via our new online box office at www.ticketsource.eu/musicofthenightmarbella or simply click “Buy Tickets” at the top of our Facebook page – www.facebook.com/musicofthenightmarbella – various advance purchase and other special offers available online. 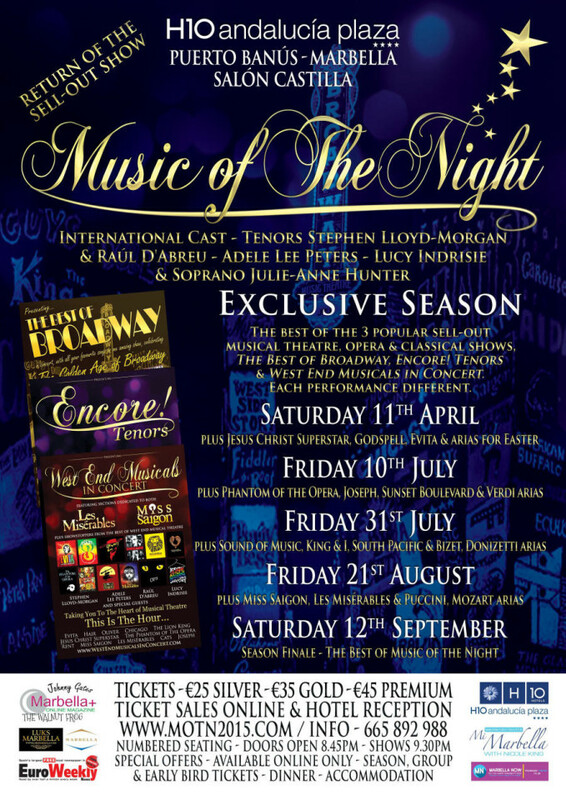 The spectacular hit show ´Music of the Night´ returns to Marbella again this year after a series of sell-out performances over the past 2 years at venues including the Starlite Festival Marbella, The Mijas Auditorium and The H10 Andalucía Plaza Hotel, Marbella. This Exclusive Season of 5 shows at the H10 Andalucía Plaza Hotel brings together the best of the 3 other popular and also sell-out musical theatre, opera and classical shows, ´West End Musicals in Concert´, ´Encore! Tenors´, and ´The Best of Broadway´. Every performance of ´Music of the Night´ is different and also includes the addition of songs from different musical theatre productions and classical composers in each show. ´Music of the Night´ is produced by Tenor Stephen Lloyd-Morgan, who stars alongside the amazing international cast of Tenor Raúl D’Abreu, Soprano Julie-Anne Hunter, Adele Lee Peters and Lucy Indrisie. Some performances may include special guests. As well as this exclusive season in Marbella, ´Music of the Night´ will also perform in other parts of Spain and Europe this year. Please see www.motn2015.com for photo gallery, reviews & previews of previous performances. Please email info@motn2015.com for full press pack.